The SEC charged a Boston-based hedge fund manager and his companies with the theft of customer assets, among other things. In its court Complaint, the SEC alleged that Andrey Hicks (“Hicks”) lied about his securities industry and money management experience to pilfer millions of dollars from investors. 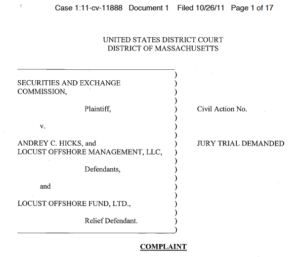 In addition to Hicks, the SEC also charged Locust Offshore Management, LLC (“LOM”) in its Complaint. Locust Offshore Management, LLC was controlled by Hicks. The SEC alleged that, in carrying out their theft of customer assets scheme, the defendants made materially false public statements and created a fictitious, high yield investment program fund (“HYIP”) to mislead investors. Hicks claimed to be a hedge fund manager seeking investments into a BVI-incorporated pooled investment fund, Locust Offshore Fund, LTD. (“LOF”) managed by LOM. The defendants supposedly deceived investors into believing that LOF was a legitimate, existing fund that had achieved extraordinary returns. The SEC claimed, however, that LOF was a fictitious entity that never existed. As explained by the SEC, Hicks’ and LOM’s theft of customer assets scheme raised millions of dollars from investors through fraudulent statements, and false public offering documents and marketing materials. In addition to knowingly lying to investors, Hicks apparently made false public statements through the distribution of a fraudulent offering memorandum and a fabricated website for LOM. According to the SEC’s court Complaint, some of the false representations made to investors by Hicks and LOM included that Hicks held undergraduate and graduate degrees from Harvard University; Hicks had previously been a successful, multibillion dollar asset manager for Barclays Capital; Credit Suisse was LOF’s prime broker and custodian; and that Ernst & Young was the auditor of LOF. The SEC asserted that all of these claims were false. A related criminal prosecution was also brought by the U.S. Department of Justice. Following the entry of the Court’s Judgments and Orders, the SEC’s Office of the Whistleblower posted a Notice of Covered Action (“NoCA”). After reviewing applicants’ award claims, the SEC’s Claims Review Staff (“CRS”) recommended granting SEC whistleblower awards to three whistleblowers. The Commission approved the CRS’s recommendation and granted awards to the three whistleblowers. 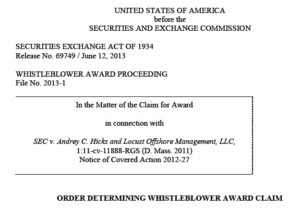 In its Order, the Commission determined that three claimants had each met the SEC whistleblower award eligibility factors because they had voluntarily provided original information to the SEC that led to the successful enforcement of the Locust Offshore case. The award was divided equally among the three claimants. 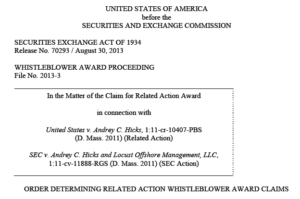 Subsequently, the Commission also granted the SEC whistleblowers an award for the related criminal action. This is a good example of one of the types of SEC whistleblower cases that could give rise to SEC whistleblower rewards if reported to the Commission through the SEC whistleblower program.